Our Homestead Barnwood Coffee Table is delightfully rustic and adds the right amount of rustic styling to your living room or other indoor area. This accent table is hand-crafted in America using rough hewn reclaimed barnwood. The upper and lower shelves will provide you with ample space for your nick nacks and other collectibles. It also features an early American stain topped with a premium grade lacquer. Both providing several layers of protection as well as accentuating the natural character of the wood. 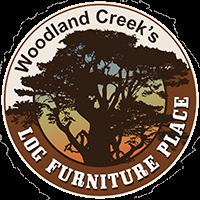 Be sure to check out matching occasional tables and furniture in our "Homestead Barnwood" collection. 24"W x 48"L x 18"H, 42lbs.